Several years ago I was at a dinner party, and a guest told me about his experience geocaching in the Hitchcock Woods in Aiken, South Carolina. It was the first time I had heard about geocaching, a modern day treasure hunting game. I listened, fascinated, as he recounted his adventure into the woods to seek and discover two geocaches. Over the past few years, I had done a little research on geocaching, but I never went out to seek a cache until this week. My dad and I were talking about our upcoming day trip to Ocotillo Wells State Vehicular Recreation Area near Borrego Springs, CA, when he mentioned that there were a lot of geocaches out there. While looking into local attractions, he had come across information about geocaching in the region. This piqued my interest, as I had been telling my dad about geocaching for the past three years, and he hadn’t been very interested in it at the time. Now he was. A downhill trail on the Devil’s Slide. An iguana on a rock near the Devil’s Slide in Ocotillo Wells. The following day my dad, my boyfriend Tony and I headed out to Ocotillo Wells, traveling in a 4WD Jeep Cherokee. We entered Ocotillo Wells from State Highway 78 and took Main St. (a dirt road), until we reached Quarry Rd. 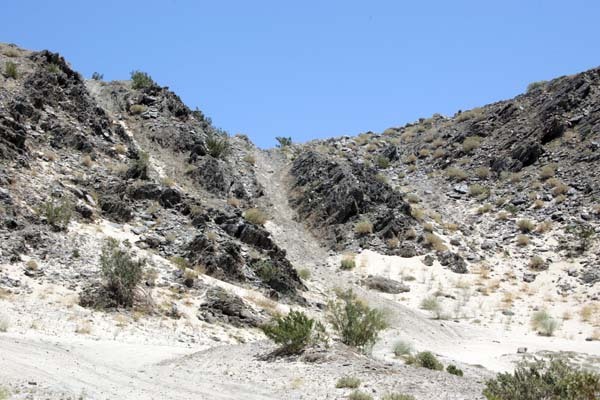 and Blow Sand Hill, a sand dune area that is a special point of interest for OHV enthusiasts. We took a few photos at Blow Sand Hill and continued on our way towards the Devil’s Slide, which was less than 10 minutes by Jeep. It was about 105 or 106°F when we arrived at the staging area for the Devil’s Slide. We pulled out our handheld GPS, several bottles of water and the printouts of the coordinates from the geocaching website. GPS and coordinates in hand while seeking the cache. Studying the cache coordinates, we set the GPS to our current location. Based on the coordinates, we were close to the north coordinate, but needed to head west to get closer to the cache location. Since my dad wasn’t into hiking, he decided to follow in the Jeep. He drove alongside the hills as Tony and I hiked along a motorcycle trail with the GPS in hand. We had to traverse a few steep hills, but the views were great at the top and well worth the effort. We walked for about 15 or 20 minutes before we got close to the cache. 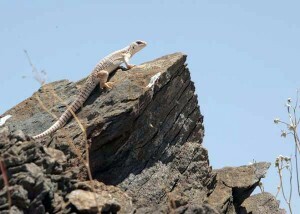 Approaching the top of a hill, we saw an iguana posing on a rock. I was able to get a couple of photos, but we didn’t linger, as I was excited to find the cache. We were getting close! Ah, one more hill, it had to be on the next one. The clues indicated that the Devil’s Slide #1 cache was not far from the trail and that the views to the north were nice there. We knew we must be just a few coordinates away from the cache location. 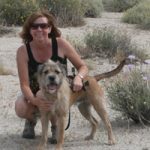 We continued walking, while we scanned the hillsides for a pile of rocks or some area where a cache could easily be hidden. And then there it was … just as described, a few feet from the road. I signed the log book and checked out the contents of the cache. It was exciting to actually find the Devil’s Slide #1 cache. The thrill of discovery can be so rewarding. I opened the cache and signed the log. I didn’t have any trinkets with me to put into the cache, so I didn’t take anything out. There were a few plastic army men, a button, a few business cards and other small items. We covered up the cache and headed back to the Jeep. The expedition was a success! The heat was rising to 112°F, and there was no wind, so we decided to return another day to find the Devil’s Slide #2 cache. It was too hot for another hike. 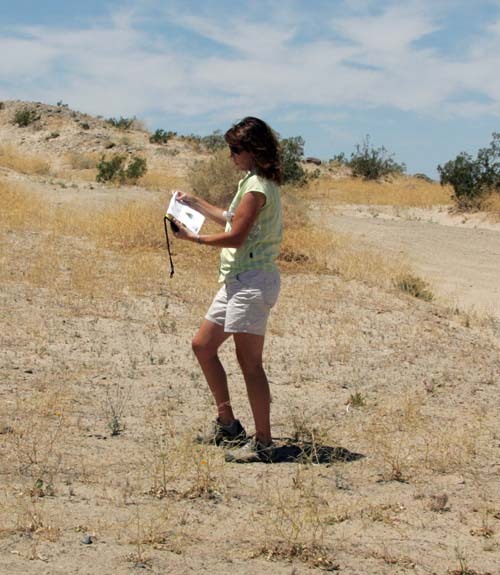 As we drove out of Ocotillo Wells, we talked about how fun geocaching was. It really added a new dimension to our desert trip. The challenge of using a GPS to track exact coordinates to the hidden cache was very satisfying and entertaining. The geocache inspired us to explore areas beyond the Jeep trail and gave more purpose to our trip. What would have been an ordinary day out in the desert had turned into a treasure hunting adventure. 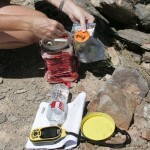 Our group plans to seek another cache on our next trip into the desert. We may even hide a few of our own caches. 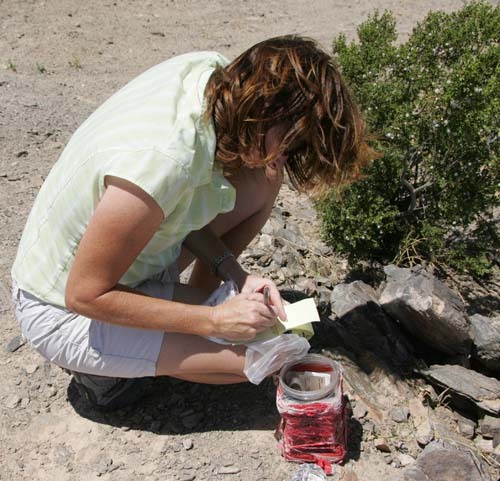 Stay tuned for more stories about DesertUSA’s geocaching adventures. For those of you who are not familiar with Geocaching, here are a few more details about this game. You use a GPS to hide and seek containers that contain a logbook and trinkets. The GPS coordinates for each geocache hidden can be obtained, with a description of the cache, on www.geocaching.com. 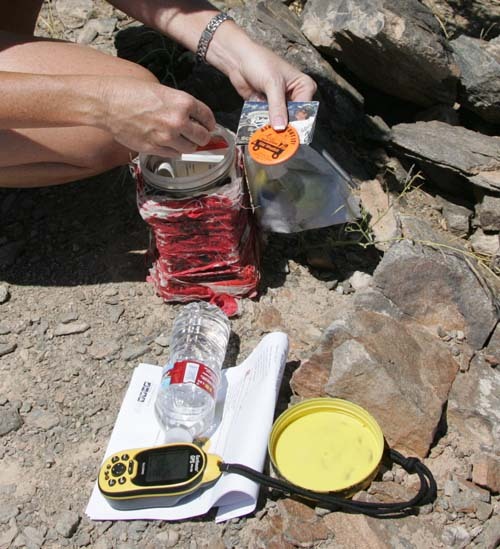 There are different types of caches, but the basic cache will contain a logbook and a variety of odd items left behind by other seekers. If you take out a trinket you replace it with another of equal value. Some caches have trackable trinkets or coins that can be followed as they are moved from one cache to another. For more information about geocaching visit https://www.geocaching.com. I’ve loved geocaching for years. Great article; thanks. FYI the Anza Borrego State Park frowns on geocaches in the park. They have removed and de-activated many.